Connect with AmeriCorps Alums at the Conference on Volunteering and Service! Grab your cowboy boots and AmeriCorps Alums gear and join us at Points of Light’s Conference on Volunteering and Service in Houston, TX, on Oct 19-21! There will be many opportunities to network, learn, and strategize with us in, and we hope to see you there! (Did you already wear out your old AmeriCorps shirt or Alums gear? You can get new Ameri-gear here!). If you haven’t already, there’s still time to register for the conference and join us for our alumni sessions (click here to sign up). For those of you that already registered for conference, check out our NEW limited-seating special event and add it to your itinerary. An overview of our new event and our other conference sessions are below. 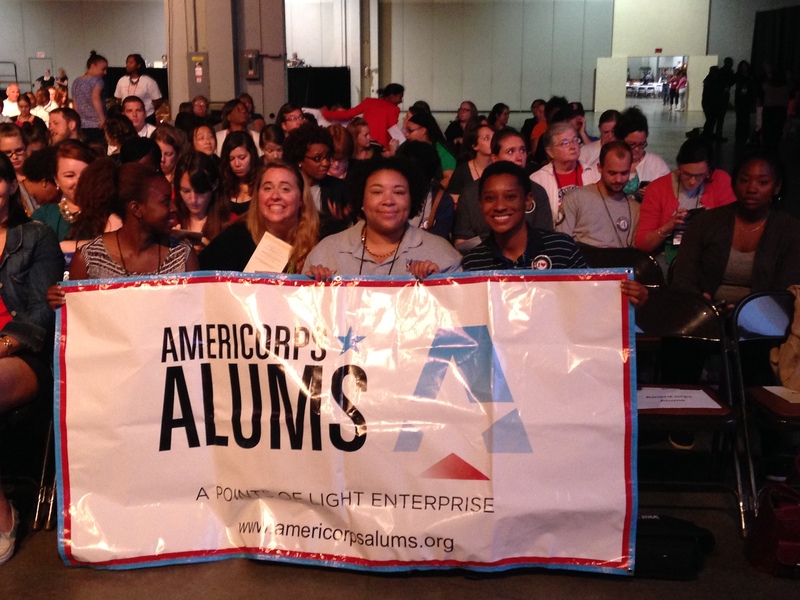 Be sure to also join us in a reserved section for AmeriCorps alums at opening and closing plenaries. AmeriCorps Alums at the 2014 Conference on Volunteering and Service. Below, we share four special Alums opportunities at Conference. Thank you for making a commitment to stay connected with us and for making communities safer, stronger, and healthier! Wednesday, October 21, 8:30-10:00 a.m. – AmeriCorps Alums Strategy Feedback Session (Log-in & add this session today or click here to register for the conference and then add this session!). Join us for a special strategic planning session on the future of AmeriCorps Alums. Learn more about our strategic direction and provide feedback on how we can continue to build the alumni movement to make communities safer, stronger, and healthier. To RSVP, you’ll need to register for conference or log back in to your registration and add this session. If you’ve already registered for conference, you’ll need to provide your Reference Number located in your confirmation. Click here to log in to your registration and RVSP. 1:30-3:00 p.m. – Ready to Take Your Volunteering to the Next Level? (a panel with a technical expert from BoardSource). If you are committed to volunteering and have the expertise, network, and time to share with a nonprofit organization, then it’s time to seriously consider serving on a board. Board members can make the work of nonprofit organizations stronger, more effective and more impactful by providing strategic leadership at the highest level. Speakers include: Anne Wallestad (CEO of BoardSource), Andrew Davis (Director of Training at BoardSource and AmeriCorps Alums National Advisory Council Vice-Chair), Daphne Brookins (Board member at the OneStar Foundation and ’95 AmeriCorps alum) and Lisa Tatum (Senior Manager at the Volunteer Center of North Texas and AmeriCorps Alums Chapter Leader). 8:30-10:00 a.m. – “Life After AmeriCorps” Starts Today: Simple Ways to Boost Your Corps Members’ Happiness and Completion Rates. If you work as an AmeriCorps program staff or just want to learn about the ways we’re supporting Corps members, join us for this overview. We’ll share best practices and concrete ways to better prepare currently serving Corps members for “life after AmeriCorps” as well as boost their happiness and service completion rates. 8:30-10:00 a.m. – The Role of National Service in Advancing Youth Opportunity Forum. Learn how AmeriCorps programs are impacting local communities and about the role of national service in creating new opportunities for at-risk youth and young people – featuring ServiceWorks as a program that works. 12:30-2:00 p.m. – AmeriCorps Alums Town Hall Luncheon (sponsored by IPSL): This event is SOLD OUT and you must have registered in advance to attend. We’ll be convening over 100 alumni to build your network, share more about our organizational priorities and results, and engage you in the movement. Other questions about conference? Please visit http://www.volunteeringandservice.org/. Can’t make it to Houston? Follow @AmeriCorpsAlums, @POLConference, and #ServiceUnites on Twitter.